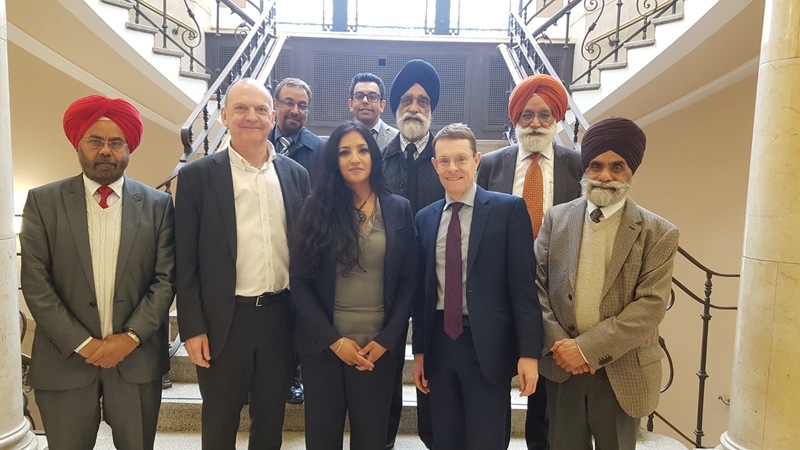 The University of Wolverhampton hosted a visit by The Mayor of the West Midlands, Andy Street, recently to update him on the progress of the Centre for Sikh and Panjabi Studies. The Centre is the first of its kind in the UK and was launched in 2018, offering PhDs and Master’s level courses in Sikh studies as well as continuing professional development (CPD) courses for teachers and managers. The Mayor joined community leaders including Avtar Singh the Head of the Council of Sikh Gurdwaras UK, Dr Sadhu Singh who is from Wolverhampton and also a regular presenter on the Sikh Channel, Dr Sujinder Sangha, a retired Principal, Councillor Kuldip Sahota from Telford and Sham Sharma, the owner of Zuri’s Coffee shop also attended, along with his son, Dr Sharma. They discussed joint working, future plans and how to continue to exchange knowledge on an international platform using the links already established with Sikh Studies scholars across the world. The Mayor gave an overview of his recent visit to Amritsar and Delhi, exploring the connectivity between the cities and the links between businesses, as well as his experience of visiting the Golden Temple for the first time. Dr Opinderjit Takhar updated the group on the progress being made at the Centre for Sikh and Panjabi Studies. She said: “We are the first centre of its kind across Europe and with it being the 550th anniversary of Guru Nanak Dev who founded the Sikh Faith, we are planning a series of exciting events during 2019. “The Centre for Sikh and Panjabi Studies is very much a part of our community, not an ivory tower research centre. Over the coming months we are planning a huge international conference. We are also delivering professional development training for Granthis and Gianis, individuals who take the religious lead in Gurdwaras. Anyone interested in getting involved with the new Centre should contact Dr Takhar by emailing: O.takhar@wlv.ac.uk.